Question: "Why does my cat attack her tail?" Marlene, Jessica, and Dustin live with their two-year-old cat, Monkey, who they adopted at a month of age when found in a bush in their driveway. Monkey was born to a feral neighborhood cat. She gets along great with the dog's Diesel and Pangea is okay with Kali, a one-year-old sister cat, and is adjusting to the new 10-week-old kitten. Monkey attacks her own tail. Marlene says Monkey did this for a short time after she was spayed a year ago. "She started again intermittently about a month ago and the frequency has increased. Now Monkey hisses and attacks her tail, hissing, and swatting at it, all day and night. She will stop for short times and then start again. We have tried talking to her, picking her up, and squirting her with water from a squirt bottle." The veterinarian could find nothing wrong and suggested it was behavioral issues and suggested tests and possibly kitty Prozac, but they're beyond the owner's current budget. Instead, the veterinarian suggested "calming drops" placed in Monkey's water, and Marlene got a "Good Behavior Calming Collar" (Available at Amazon) which have helped "a tiny bit but not much. I like to recommend we examine behavior problems first from the physical and then emotional health. You can use the H.I.S.S. Test, which stands for health, instinct, stress, and symptom solvers. Your veterinarian may have eliminated all these possibilities, but I'll keep this response general to help as many other readers as possible. I'm sure your veterinarian gave Monkey a thorough exam. In many cases, though, self-directed aggression is prompted by discomfort. Something as simple as a flea bite on the tail, or arthritic tail joint could spur interest in the tail that escalates to attack. Since this first happened immediately following a spay, it appears discomfort can be a trigger for Monkey. In addition, a rather uncommon condition called hyperesthesia syndrome can be characterized by tail chasing and rippling skin on the cat's back. Motion triggers instinctive hunting behavior. 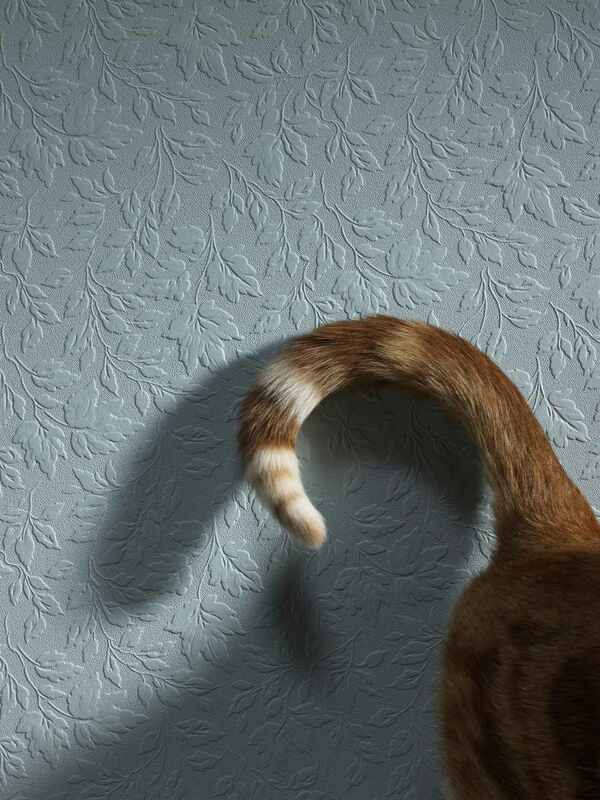 Kittens especially target their own (or other cats') tails during play aggression. Usually, the youngster outgrows this type of behavior. Stress can prompt all kinds of behaviors and health issues. What stresses cats varies between individual animals. For some, it might be changing the drapes, while other cats maintain emotional health through an earthquake. Redirected aggression is one-way cats relieve excess stress, and it would be uncommon but possible that Monkey redirects aggression at her own tail in an effort to relieve the angst. What you describe could be one or any combination of some of the scenarios suggested above. Unfortunately, without further tests suggested by your veterinarian, it's doubtful you'll find a specific cause. The self-directed attack can lead to the mutilation of the tail and isn't something that I can really advise you about treatment. The underlying cause has to be determined. Radiographs (X-rays) to check the bones and joints, for example, or evaluate for nerve damage in the tail, or a second opinion from a veterinary dermatologist could check for parasites. Hyperesthesia syndrome is difficult to diagnose even with many tests by a neurologist. The SentryHC Good Behavior Collar uses pheromones that mother cats produced when nursing that reduces the baby's fear, and also works to reduce adult cat fear. If this is a painful or neurological condition and not fear-related, the collar may not help but probably wouldn't hurt. Unfortunately, the link you sent in reference to the "calming drops" didn't work so I'm guessing at what that might be-perhaps Rescue Remedy? I don't know if the Prozac would help, either. There's been quite some delay since you submitted your question to my answer so I hope Monkey's issues have gotten better. If not, I hope you'll be able to finally run some of those further tests to get her some help.